Blackbird Energy Inc. is pleased to announce that it has completed the construction of its 100% owned and operated 12-14-70-7W6 Elmworth facility and gathering system. Blackbird is also pleased to provide an operational update regarding its previously announced accelerated business plan and the Stage Completions (Stage) roll-out. Blackbird has completed the construction of its Elmworth/Pipestone Facility and gathering system, with preliminary estimates indicating the construction was completed, with certain enhancements, near the budget of US$16.1 million. Commencement of production is anticipated by the end of January 2017. Blackbird has completed the previously announced 3-28 well drilling operations and will commence completion operations in the near term. Following the 3-28 drilling operations, the rig was released and moved to the previously announced 2-20/11-9 location. The 2-20/11-9 well was spud on 28 December 2016. Stage continues to achieve success in the deployment of its Bowhead II System (Stage System) across a number of basins, with six Stage Systems deployed to date and an additional 12 Stage Systems estimated to be deployed by the end of 1Q17. Blackbird has completed the construction of its 100% owned and operated Elmworth facility and gathering system. Blackbird overcame adverse fall and winter weather conditions and was on schedule to commence production on time. Third party factors outside of the company's control, including a plant turnaround, have resulted in anticipated commissioning of the facility and gathering system at the end of January 2017. Due to the fact that the delay was outside of Blackbird's control, the company will not incur any contracted sour processing or transportation fees until the commencement of production. On a preliminary basis, estimates indicate that the facility and gathering system was constructed, with certain enhancements, near the budget of US$16.1 million. In conjunction with the construction of the company's facility and gathering system, Blackbird has tied-in the 6-26, 5-26, 2-20, and 02/2-20 wells (initial wells). The 3-28 well is scheduled to be tied-in by calendar 2Q017. The 2-20/11-9 well will be tied-in as part of Blackbird's eastern infrastructure development plan, which is currently in the front end engineering design phase. As previously reported, Blackbird's facility will have an initial capacity of approximately 10 million ft3/d of natural gas plus associated liquids of approximately 1500 bpd, for aggregate throughput of approximately 3150 boe/d. The Facility includes liquids recovery and stabilisation. The facility has been designed to allow for future production expansion beyond 10 million ft3/d, 1,500 bpd and 3150 boe/d. While 3150 boe/d represents the Facility's current capacity, Blackbird's current sour natural gas processing contract amounts to 6.3 million ft3/d plus associated liquids and Blackbird's current Alliance sales gas takeaway agreement amounts to 5.0 million ft3/d of natural gas to be shipped to the Chicago market (initial production capacity). Blackbird is currently evaluating numerous alternatives to increase both its sour processing and sales gas takeaway capacity in the Alliance pipeline system and/or the TransCanada NGTL pipeline system. Blackbird expects to achieve its initial production capacity within approximately four weeks of commissioning its facility and gathering system, as the initial wells are still cleaning up and recovering load fluid. Garth Braun, Blackbird's Chairman, Chief Executive Officer and President, stated: "The completion of our infrastructure construction marks an important milestone in the transition of Blackbird to a producing oil and gas company. Looking forward, we are focused on increasing our sour gas processing throughput, reducing costs, and prudently developing our Elmworth/Pipestone asset in a responsible manner. With this significant infrastructure capital behind us, the groundwork has been laid for scalable growth using cash flow and pad-drilling techniques, which should further decrease our all-in well costs." 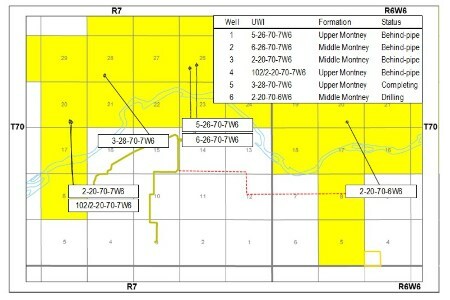 The previously announced 3-28 Upper Montney well was spud on 23 November 2016 from surface location 11-15-70-7W6 and drilled to a measured depth of 4120 m, including an approximately 1,500 meter lateral section to 15-21-70-7W6. This well was drilled in an area that has been deemed the ‘volatile oil’ window by an industry leader. On a preliminary basis, estimates indicate that the 3-28 well was drilled approximately US$0.3 million under the budget of US$3.0 million. Completion operations on the 3-28 well commenced on 10 January 2017 utilising the stage system. The completion programme will place approximately 50 t of sand per stage over approximately 56 stages, the highest frac intensity of any Blackbird wells to date. Consistent with practices of a regional industry leader, Blackbird plans to let the frac fluid imbibe in the 3-28 well for approximately four months before flowing the well back into the gathering system, with initial production anticipated by June 2017. This is anticipated to reduce testing and flow-back costs. On 28 December 2016 Blackbird spud its sixth Montney well, the previously announced 2-20/11-9. This well targets the Middle Montney at Elmworth/Pipestone in the ‘volatile oil’ window. The well was spud from surface location 11-9-70-6W6 and will have a lateral length of approximately 1950 m to a downhole location of 2-20-70-6W6. Subsequent to the 2-20/11-9 drilling operations, Blackbird will conduct a large-scale, high tonnage slickwater completion programme similar to the 3-28 programme, again utilising the stage system. The completion programme will place approximately 50 t of sand per stage over approximately 80 stages. A second business objective of Blackbird's accelerated business plan was to strategically retain core Elmworth/Pipestone lands. Upon successful completion of the 3-28 and 2-20/11-9 drilling programmes, 14 core sections of Elmworth/Pipestone land that was set to expire is expected to be retained, leaving only four non-core sections of land with expiry dates within fiscal 2017. The company expects to manage any potential expiries going forward through the execution of its business plan. Garth Braun commented: "Through our accelerated business plan, we expect that we will retain all core Elmworth/Pipestone lands that would have expired during fiscal 2017. Our strategic delineation of the Upper and Middle Montney intervals over a large geographic area has provided us with very valuable information regarding our resource in-place, and solidifies our confidence in the next phase of Blackbird's growth. We will continue our delineation program and proceed into a development phase on our western development block. Through this development phase, we will look to increase production and reserves while maximising the value of our infrastructure investment." The roll out of the stage system has been occurring at a rapid pace, with the technology now having been successfully deployed in six wells to date in the Montney, Permian, Eagle Ford and Cardium formations. By the end of 1Q17, the stage system is expected to be deployed in an additional 12 wells by numerous senior operators in North America and Asia targeting the Duvernay, Montney, Eagle Ford, Scoop and a formation in China. Stage plans to release more detailed 2017 guidance in the next 30 - 60 days.